New Ducati Panigale V4R Spreads Its Wings—In two ways Ducati’s all-new WorldSBK Panigale V4R machine spread its wings at Motorland Aragon in the first post-season winter test. 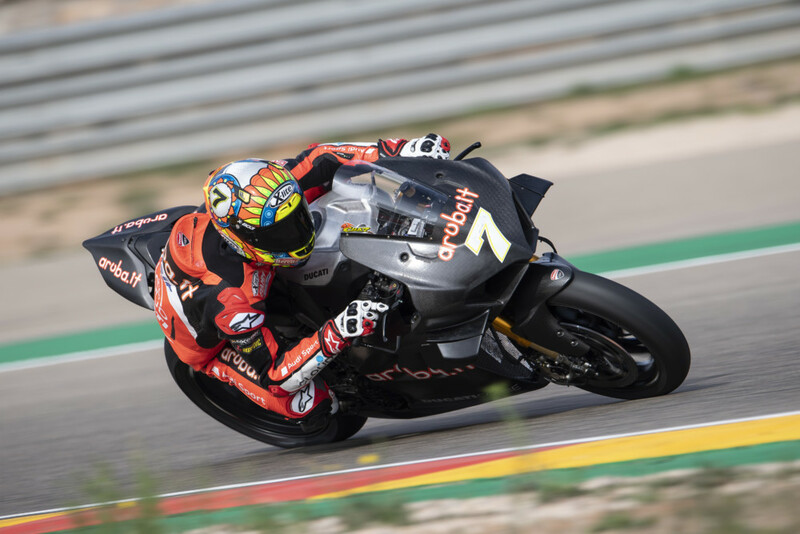 Aruba.it Racing Ducati rider Chaz Davies and Barni Racing Ducati new signing Michael Ruben Rinaldi took to the track on their full WorldSBK spec machines, winglets and all, on Wednesday morning. There was no 2019 Aruba.it Ducati signing Alvaro Bautista, as he is as yet racing MotoGP, at Valencia in the coming days. Davies and the new Ducati get to know each other at Aragon. The new wings on the fairing have already started courting controversy. The winglets fitted to the new Ducati V4 have caused much consternation in some quarters, but they are not just legal for WorldSBK use, but mandatory for the Ducati, as they are considered to be an integral part of the stock bike. For that reason, they cannot be removed from the race bike’s bodywork. Ducati’s engineering guru in WorldSBK, Marco Zambenedetti, explained the place this novelty plays inside the WorldSBK paddock. The exact wording in the 2018 FIM technical rules is below. Gordon Ritchie | World Superbike Editor You may not understand Ritchie and his Scottish accent if you had him on the phone, but you can definitely understand what he writes as our World Superbike editor.